Salt water is a byproduct of oil and natural gas extraction. Typically, the salt water contains residual oil. For companies involved in the disposal of salt water, removing the residual oil from the water offers potentially significant economic benefit. One salt water disposal facility successfully used a Model 6V Brill® oil skimmer with the free floating collector tube, from Oil Skimmers, Inc. to remove oil from its disposal pit. The Model 6V performed flawlessly and provided significant economic benefits and an ROI measured in weeks, not months or years. The disposal facilities’ business grew to the point where additional oil removal capability was required. 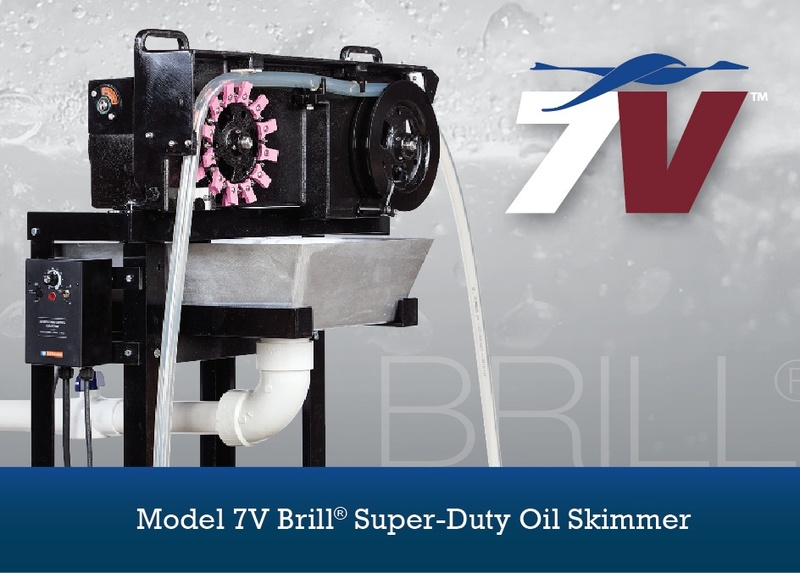 In response to the need, Oil Skimmers, Inc. offered the heavy duty, high capacity Model 7V Brill® tube-type oil skimmer. Like other oil skimmers in Oil Skimmers, Inc.’s lineup, the Model 7V features a free floating, closed-loop tube that skims the wastewater’s surface. Oil adheres to the outside of the tube and is drawn into the oil skimmer and through ceramic scrapers that remove the oil. The free floating collector tube then returns to the water’s surface to collect more oil, while the recovered oil flows to a collection container. The Model 7V features a larger free floating collector tube with more surface area than standard Model 6V tube. It also features a variable speed controller, which makes it easy to increase speed of the oil removal process, or dial it down as requirements change. Variable speed control is ideal for accommodating different quantities, viscosities (fast for thin, slower for thick) and sudden increases in oil volume, such as spills. The 7V also features a heavy duty exterior coating that delivers resistance to corrosion and chemicals, and performs well even in harsh weather conditions and extreme temperatures. The unit has a number of options including heat and insulation and is available with the full range of mounts and attachment options to facilitate easy installation across the spectrum of industrial applications. By adding the Model 7V to its operations, the salt-water disposal facility was able to increase its oil pickup rate by more than 250 percent and so the facility was able to sell more “waste” oil for another quick return on its investment. With numerous mounting systems available to ensure easy installation and peak performance, Oil Skimmers, Inc. can specify and install an oil skimmer that is customized specifically for your application needs.